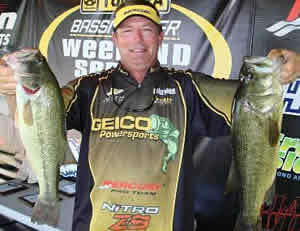 Geico angler Teddy Carr qualified for the Bassmaster regional event to be held later this month on Lake Erie. 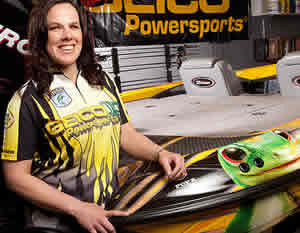 Geico angler Christiana Bradley qualified for the Bassmaster regional event to be held later this month on Lake Erie. MARBURY, Maryland -- GEICO anglers Christiana Bradley and Teddy Carr accomplished their primary goals in Saturday and Sunday's Bassmaster Weekend Series event on the Potomac River. Both anglers earned enough points in the two-day divisional tournament to qualify for the Bassmaster regional event to be held later this month on Lake Erie. Bradley caught 19.75 pounds of fish to finish 35th in the Potomac tournament. The total lifted her to 26th place in the Division 21 (Maryland) standings with 1,229 points, which qualified her for the regional event. "I am pleased with how I did," Bradley said. "I finished only a couple pounds out of the money so that was exciting. I moved up eight places and qualified for the regional championship. I'm looking forward to my first time fishing, let alone even seeing in person, one of the Great Lakes." Carr finished 15th in Division 21 with 1,319 points after a 38th-place finish on the Potomac. He caught 19.14 pounds of fish in the two-day event. This marks the Carr's fifth consecutive time that Carr has qualified for the regional event. "Even though you're sitting pretty good in the points, the No. 1 goal is to catch enough fish to get in the regional," Carr said. "We did that." Conditions on the Potomac were difficult as the river has been inundated with rain from recent tropical storms and their remnants. Bradley caught 10.91 pounds on Saturday's first day, then followed with 8.84 pounds Sunday. She reached her five-fish limit both days. "This weekend was tough, just as I expected," Bradley said. "To top off the hurricane and tropical storm, we had a full moon � which is never good for fishing, especially in tidal water, unless you're fishing at night � and the most severe early cold front I can remember this early in then year. "It was severe because overnight temps dropped from 70 to 40 in three days. The water temp is down over 10 degrees since Labor Day. Cold fronts are known for shutting fish down. That's what I experienced." Carr won this event in 2009 and went all-out for another victory, knowing he had locked up a spot on the Lake Erie regional. Carr landed 9.18 pounds on Saturday and 9.96 on Sunday. "I was going to swing for the fences," Carr said. "Saturday, I either misjudged my areas or the big fish didn't bite for whatever reason. I caught plenty of fish; I caught about three limits, but I just could not get a big bite. "Sunday I kept the swinging-for-the-fences mentality to try to catch a big bag, so I ran way south to an area that normally holds quality fish. I just struggled and could not get hits. I ran back to my previous areas and got another nine pounds." The regional championship will be held Sept. 30-Oct. 1 for qualified anglers from Maryland, Ohio, Virginia, and east and west New York.